Any holiday, however long or short, in my books deserves a cultural fix; a museum, National Trust property, something to remind us there is more to life than the X-box, Wii, iPod/Pad, etc. So for our annual 2 day trip to London, I booked tickets to visit the Royal Mews along with The Queen’s Gallery that was exhibiting ‘The Heart of the Great Alone’ – a collection of Antarctic photography including images of those great explorers Scott and Shackleton. Designed by John Nash in 1828, the Arch roundabout is worth a visit, with an extensive war memorial adjacent to the Arch, that has been cleverly designed to highlight the various conflicts that have stolen the lives of so many people. There is also an interesting group of sculptures that seem to have a link with the Antipodes. I can’t say I agree with their positioning, they looked a little like abandoned steel girders that had been stabbed into the ground, but combined with the Arch and memorial, it has created what is probably one of the few extremely interesting roundabouts in the middle of London! Sadly we didn’t linger because the weather was pretty awful and we had to walk down (or is it ‘up’?) The Mall. Again, an absolute pleasure to walk down the long stretch of this royal tree-lined avenue. The huge trees and expanse of park area to the left giving a feeling of space and relaxation making you want to saunter down the avenue, with the possible sighting of horse and rider trotting by or if you’re lucky enough, the Household Cavalry. Whilst HM was away in Australia, HRH was at home, carrying out various investitures. We saw a small group of posh-frocked people coming out of the palace and making their way nonchalantly across the palace forecourt. We finally arrived at the Royal Mews and wisely used the audio guide that explain what is what. Now here’s a bit of general knowledge for you: the name ‘mews’ derives from the French word mue meaning a change of coat or skin. In this case, it refers to the Middle Ages’ Royal hobby of keeping falcons and when the birds were ‘mewing’ or moulting their plumage, they were kept in cages that became known as ….. the Royal Mews. Anyway, each carriage was housed in its own barn with a written explanation as to its history and purpose. The Glass Coach used for the doomed Di/Charles wedding was there along with a host of other coaches used for state occasions. 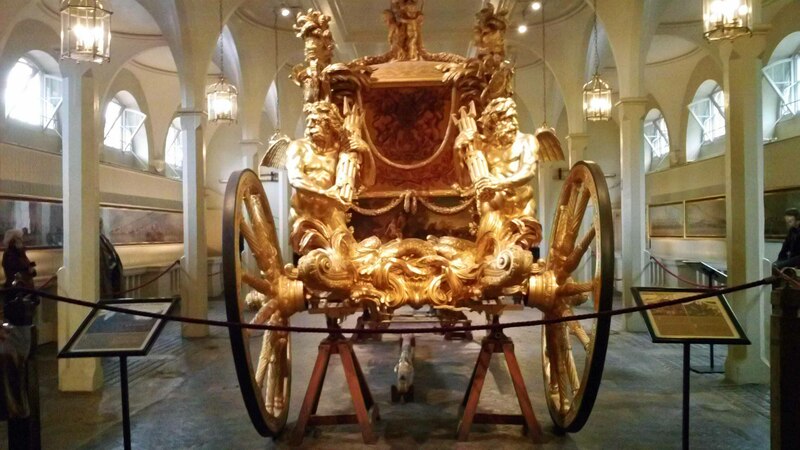 But the pièce de résistance is the remarkable 18th century Gold State Coach. Diarist of the time, Horace Walpole wrote “There is come forth a new State Coach, which has cost £8,000. It is a beautiful object ….. formed of palm trees, which are as little aquatic as Tritons are terrestrial.” It would seem he marvelled at but disapproved of this great Coach. It is not used very often, which given its size 7.3m (24 ft long), 2.5m (8 ft 3″) wide, and 3.9m (13 ft) high and weighing in at around 4 tonnes is not surprising. They also have to remove an entire wall to get the huge coach out of its shed! It’s also reportedly very uncomfortable, William IV likened it to a ship being tossed on a rough sea! After the splendour of the Royal Mews, we made our way to the Queen’s Gallery, again they supplied the useful audio equipment. The black and white photographs, many of which were taken by Herbert Ponting and Frank Hurley, tell an incredible and awe inspiring story of the early 20th century great explorers, who had little more than woolly socks and furry mittens to keep themselves warm. The photos are a harrowing reminder that the Antarctic is a wild and inhospitable place, where only the greatest adventurers would dare to go. The hardship and unimaginable torture these men went through is hardly discernible when you look at the photos from the initial stages of their journey. It is only the later images that give you a clue as to the immense pain and suffering they must have endured. Fortunately the diaries, letters, photographic negatives and flags were all retrieved so that the rest of the world could marvel at the incredible fortitude and determination of a small group of men who saw no reason to have their dreams thwarted by something as simple as the raw unchallengeable strength of nature’s cruelest territory. There is a wonderful brochure available to buy that contains the images along with plenty of text to explain each one. Worth every penny! So with my appetite for culture sated, I allowed my sons a trip to the more commercial side of London, but that deserves a blog of a different nature…..! This entry was posted in Family Days Out and tagged Antartctic, Buckingham Palace, London, Marble Arch, Queen, Queens' Gallery, Scott. Bookmark the permalink.